Sixteen and a half years ago I picked up a paperback book that would help change my entire life. From my diet, exercise regime and the way I treated others in the world, they would all dramatically shift the moment I read Dan Millman’s “Way Of The Peaceful Warrior“. The tagline on the book is “A Book That Changes Lives” and boy oh boy was he right. Right before I turned 21 years of age I was in a very difficult transition period in my life. I had began a new search for internal growth and was reaching out to different mentors and teachers that could help guide me away from a fairly dark world. I came across an old guy named Tom who had been teaching one of my good friends classical music and mediation for a couple years. The growth I saw in my buddy was tremendous and I was a bit jealous and eager to experience the same. So, I packed up my belongings into a 1984 Chevy conversion van and hit the road to Idaho to learn a new way of life. 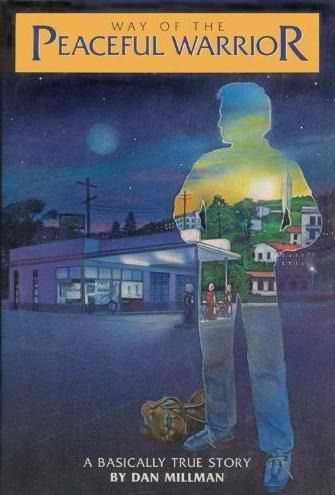 Tom told me… “Before you come to Idaho, make sure you read this book “Way Of The Peaceful Warrior”. I did as I was told, and it excited me even further to make the move to Idaho to begin this inner transformation. The book was incredible and offered me a ton of hope. It made me feel good about myself and my future. And most importantly, it helped me to rid myself of some horrible thought patterns and destructive activities that served me no good purpose. As I was stumbling around the internet this morning I came across some motivational quotes by Dan Millman and thought I’d repurpose them here on the blog and link to his book as I get the feeling it could possibly help you out as well. You can grab Way Of The Peaceful Warrior for as little as $3.10 at Amazon by CLICKING HERE. I’ve seen the movie, I guess I’ll have to read this book. Thanks Jason for bring this to my attention. Never seen the movie myself, although I’d like to. I’ve heard from multiple people that it’s a good movie but nothing like the book, which seems to be true of almost all books made into movies. Seems like an interesting book. I was also impressed by a book when I was around 18 – I forgot the title of the book. What it said was basically, ‘There is nothing like living happily ever after’ and I still agree to that point of view. It was a revelation back then!